Lark Publishing has now produced three volumes in their wonderfully fun Bounty of Bead and Wire series! 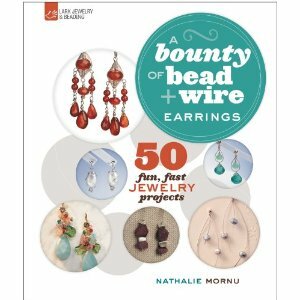 I shared a review of the first, A Bounty of Bead and Wire Earrings, back in February (read by review here). So now the good people at Lark have sent me the next two: A Bounty of Bead and Wire Necklaces and a Bounty of Bead and Wire Bracelets. What to do? What to do? I know...since I have all three, I'm gonna give them away!! One each week, starting with A Bounty of Bead and Wire Earrings. Please make sure that your link will lead me to an email address, or else I won't be able to contact you. No contact, no win, and I simply have to go on to the next person. Deadline: December 12. This looks like a cool book. Would love to win it. Thanx for a chance to win this book. I love larks books and have many of them. This book sounds like fun. I tweeted about your free book giveaway. I have really been into making earrings lately. This book would be a great reference! Thanks for the awesome giveaway! Pretty please count me in! I have not seen these books but they look wonderful and look like they would be fun to learn from! Thank you for the generous giveaway and all of the wonderful inspiration from your blog! This book looks great! Hope I win! I love working with wire and would love to win this. This looks like a great book. Thanks for the chance to win one. I love wearing earrings and enjoy making them but run out of ideas so having this book would be super ! Thank You for the chance to win one ! Merry Christmas & A Happy New Year! Books are a wonderful source of inspiration. Thank you. Would love a chance to esplore new dimension in beading ! Thank you Cyndi. You're so generous with your tutorials and blog. I love your tutorials and patterns. I would love to have the 'A Bounty of Bead and Wire' books. I look forward to reading your emails. Keep up the good works.